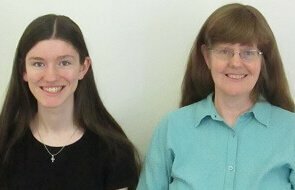 Are you studying about the kings of Israel? 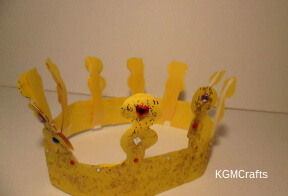 Making David Bible crafts can teach your kids about the life of an Israel ruler. David had an interesting life. and died a king of Israel. We have crafts to show the different milestones in his life. 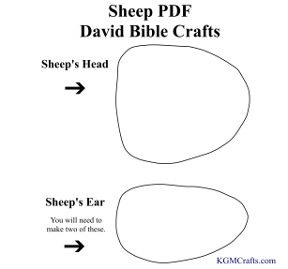 Click the pictures to find directions to the individual David Bible crafts on the page. Samuel went to David's family looking for a king. The dad brought his sons one by one to Samuel. Samuel looked at each one but God said not this son. When Samuel came to the last boy he asked if that was all. The father said there was one still in the field watching the sheep. You can read about Samuel visiting David's family in 1 Samuel 16:1-13. Every shepherd needs a flock of sheep so you might want to make more than one. 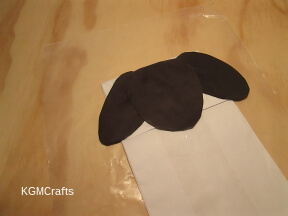 Cut the two ears and the head out of black paper. 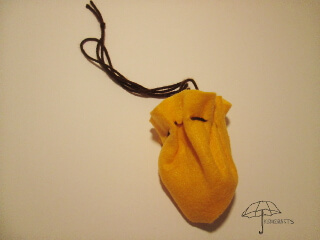 Glue to the flap on the paper bag. 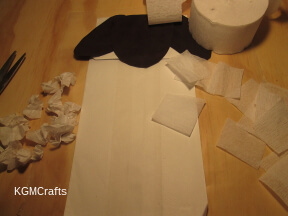 Cut a square from the streamer or white tissue paper. Wad the pieces up. 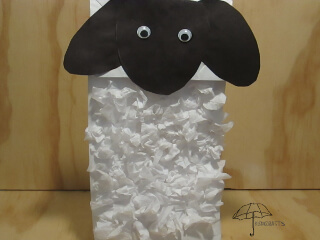 Glue to the bag to make the sheep look furry. Then add wiggly eyes. After David was anointed king by Samuel he went to the court of Saul because he was tormented. It was suggested that the music of a lyre would soothe Saul's soul. David was the person called to play. (1 Samuel 16:14-23) He also wrote many of the Psalms which are worship songs. A lyre is similar to a harp. 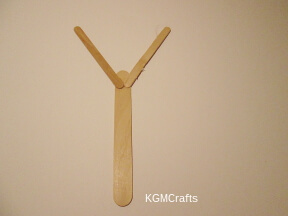 Glue the three craft sticks together at an angle. 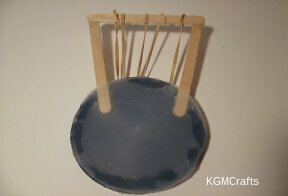 Glue the two ends to one of the lids. 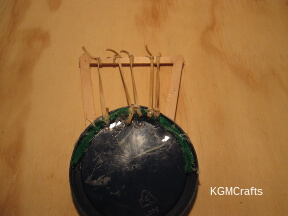 Cut the other lid so that it is flat and will fit on the craft sticks and lid. Cut 5 rubber bands in half. 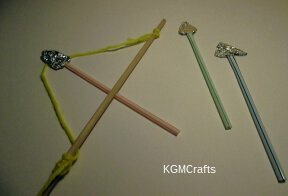 Tie the rubber bands to the top craft stick. Tie the other end to a pipe cleaner. 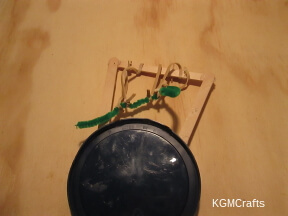 Glue the pipe cleaner under the rim of the lid. Israel was at war with the Philistines. One giant of a man started taunting the men of Israel. The giant's name was Goliath. No one would fight him except David. You can read about David and Goliath in 1 Samuel 17. These David Bible crafts will help your child remember the story of Goliath. David refused the armor and weapons that Saul offered. He instead used his shepherd's slingshot. 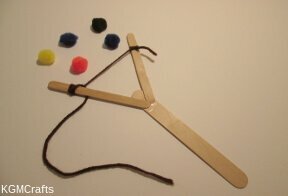 The slingshot that we will make is probably different than the one that David used. His looked more like a piece of leather with string on two sides. Rocks were placed in the leather piece then the item was swung around the shepherd's head and then one end was let loose and the rock would hit its target. 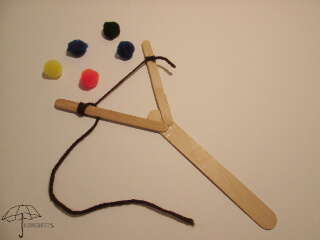 Our slingshot will shoot pompoms, but to be extra safe don't shoot anyone. 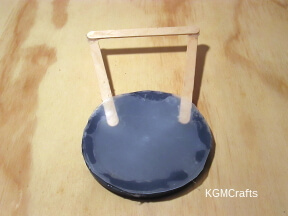 Glue the two Popsicle sticks to the top of the jumbo stick at an angle. Place under some wax paper and top with a heavy book. Let dry overnight. Cut 22 inches of yarn. 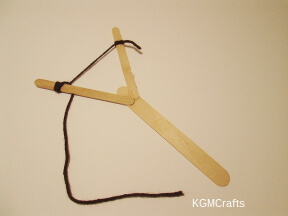 Wrap one end of the yarn around one of the Popsicle sticks. Tie in a knot. Pull the yarn tight and tie on the other side. 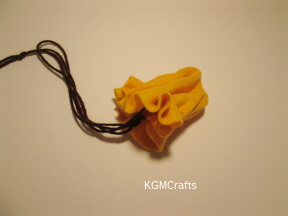 Place a pompom in the center of the yarn, hold with your thumb and first finger. Pull and let go the pompom should go flying. David chose five rocks to place in his rock bag. 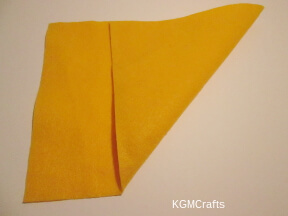 Fold a rectangle piece of felt over and make a triangle. Cut off the small rectangle. Now you should have a square that measures 9 inches. 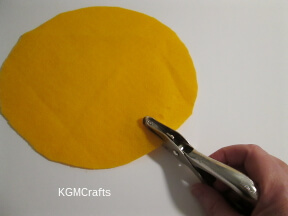 Round a 9-inch square piece of felt. 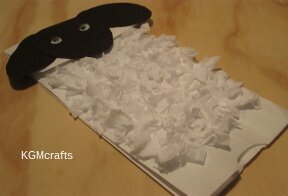 Punch holes along the edge with a hole punch. Cut approximately 4 feet of yarn. Thread the yarn through the holes and tie. Pull the yarn tight to make a bag. Add your pompom rocks. 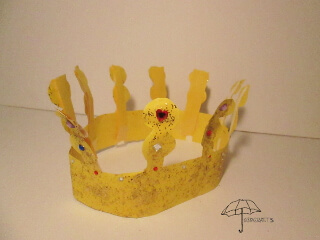 The David Bible crafts that we have done so far can also remind us of David's youth. He took care of the sheep. Defended them with a slingshot and played learned to play the lyre. Jonathan gave David his armor, sword, bow, and belt as an act of friendship. You can read about it in the 18th chapter of 1 Samuel. He also warned David with an arrow you can read it in 1 Samuel 20:18-42. Tie approximately 30 inches piece of yarn to both ends of the wooden dowel. 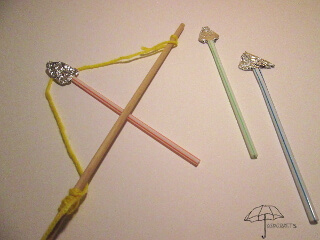 Cut the bendable part of the straw off. Draw a Christmas tree shape on cardstock. You want the triangle to be about 1 inch. The rectangle is approximately 1 /4 inch wide so that it will fit inside of the straw. 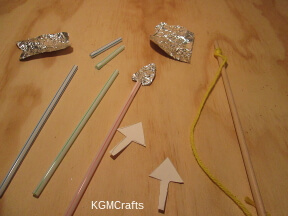 Cover the triangle with a small piece of foil. Place the rectangle inside the straw. Now your arrow is done. The crown of Rabbah was said to weigh a talent which is equal to 75 pounds. This one will be a lot lighter than that. 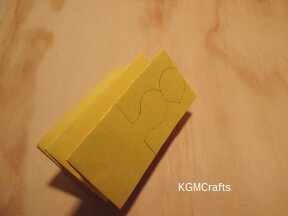 Fold a 9 by 12 inch piece of yellow construction paper in half. Fold accordion style four times. The piece should measure 4 1 /2 by 2 1 2 inches. 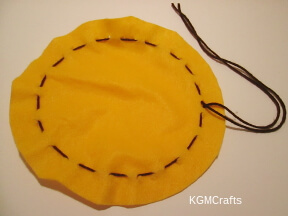 Draw a small circle near the cut edge. Draw another circle below the first. A bottle cap is about the right size for the circle. 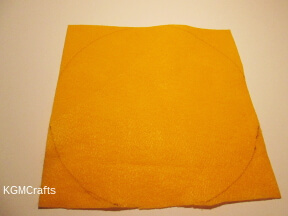 Draw 1 /2 inch square below the circle. You should have 2 inches left from the square to the fold. Cut from the folds to the sides of the square. Cut up to the first circle. Cut around the side of the circle but don't cut the circles apart. 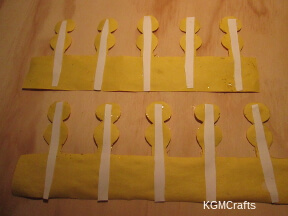 Cut along the bottom fold to make two crown pieces. Thin some white glue with water. Add gold glitter. 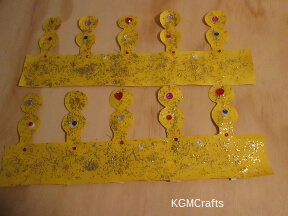 Paint the glitter glue mixture on your crown pieces. Sprinkle with more glitter. Let dry. So the arches stay up glue strips of cardstock on the back side. 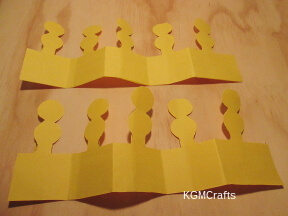 Then cover the cardstock with yellow construction paper. 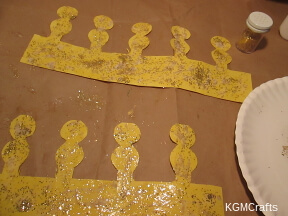 When the glue is dry add plastic “jewels” with white glue. Staple the two pieces together and place on your head. Creating David Bible crafts will help your child learn about the life of this interesting character.